Time was running out on Wofford’s dream season, and college basketball’s all-time leading 3-point shooter was desperate to make something happen. He dribbled behind his back, but he couldn’t shake Ashton Hagans. He crossed over once more, but again the Kentucky sophomore was right there. Finally, in desperation, he rose and fired a contested 3-pointer that clanged harmlessly off the rim as so many already had. It was that kind of day for Fletcher Magee, the celebrated long-range marksman who could not find his range against Kentucky’s long, athletic and smothering perimeter defense. 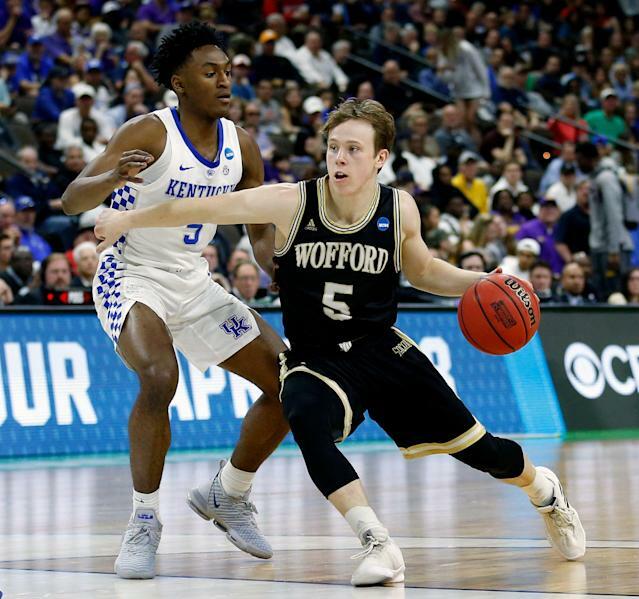 Hounded by Hagans and Tyler Herro and trapped on every ball screen he tried to use, Magee missed all 12 threes he attempted in seventh-seeded Wofford’s 62-56 second-round NCAA tournament loss. It was not Fletcher Magee's day. Magee finished with eight points, more than 12 below his season average. It was the most 3-point attempts without a make by any player in an NCAA tournament game. It was also only the fourth time in the senior’s four-year college career that he failed to make a single 3-pointer. Holding Magee in check and limiting Wofford to 37.5 percent shooting as a team was the biggest reason second-seeded Kentucky avoided an upset in a spot where the Wildcats appeared vulnerable. They were missing leading scorer and rebounder P.J. Washington and facing a torrid-shooting mid-major that hadn’t lost since mid-December. Wofford trimmed a nine-point second-half deficit to two on a tip-in by Keve Aluma in the final minute, but Kentucky had an answer. 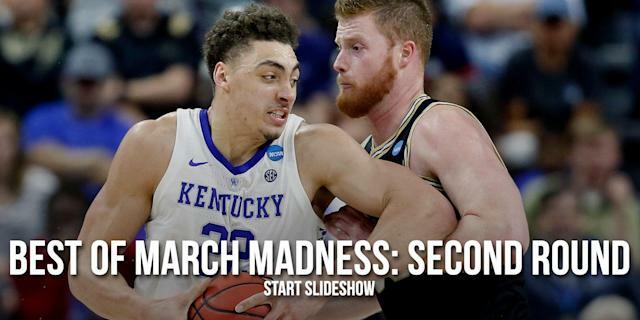 Reid Travis and Tyler Herro both sank a pair of foul shots sandwiched around Magee’s final desperate 3-point miss, securing Kentucky a Sweet 16 date against either Houston or Ohio State. Not only does Kentucky’s victory send the Wildcats to the second weekend of the NCAA tournament for the eighth time in 10 seasons under John Calipari, it also gives Washington another week to heal. Washington watched from the bench Saturday with a hard cast on his sprained left foot, an injury he suffered during the SEC semifinals last Saturday against Tennessee. Washington's absence added to the intrigue entering Saturday's already compelling matchup. This was a showdown between two very good teams with two very different histories. One boasts eight national championships, 17 Final Fours and 59 NCAA tournament appearances. The other didn’t have an NCAA tournament victory before defeating Seton Hall on Thursday night. One boasts six former Rivals top 25 prospects. The other has a roster full of players unwanted by power-conference schools. In the end, talent won out. The Terriers may have won 30 games and dominated an unusually strong Southern Conference this season, but they hadn't faced many teams with Kentucky's combination of length, quickness and athleticism. While Wofford defended Kentucky admirably, the Terriers could not generate many clean looks at the rim, nor could their shooters find a sliver of space on the perimeter. Nathan Hoover went 4 of 5 from behind the arc, but the rest of the team was 4 of 22. Of course, nobody struggled more than Magee, a cruel ending to his outstanding career.